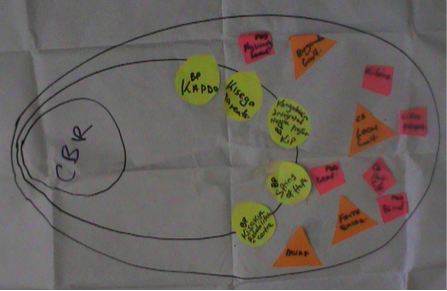 Double Loop supports over 15 partner organizations of the connect 4 change alliance in Kenya and Uganda to better understand the of effect of ICT pilot interventions in their education and economic development programs. Through action research partners collect data that are used to adjust the interventions to the social and cultural context of the target audience. Double Loop has conducted an impact assessment as a means to availing empirical evidence of the impact of access of persons with disabilities to microfinance services. The assessment also looked at the change dynamics that have taken place within the microfinance institutes, to guide and shape the project implementation in the future. Double Loop has supported NUDIPU and AMFIU in the development of their next long term plan for an Economic Empowerment Program. This has been done using elements of Outcome Mapping, and applying a programmatic approach. The M&E framework is actor and change oriented; in a bridging year the program will pilot with benchmarking tools for inclusion. 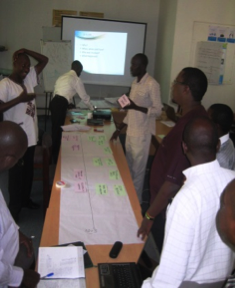 Double Loop supports two implementing partners of RutgersWPF in Uganda and Kenya in conducting operational and action research together with 10 secondary schools. This is done around The World Starts With Me, a computer based, rights-based, comprehensive sexuality education programme for young people. This assignment aimed at supporting Edukans and the Local Expertise Centres in Uganda, Kenya and Ethiopia in the implementation and follow up of the Edukans Assessment Tool (EAT). Double Loop introduced a self-assessment tool, based on the 5 C framework to complement the EAT. Double Loop has co facilitated a three day training on ‘Working towards Evidence and Rights Based SRHR and HIV prevention interventions for youth’. Double Loop supported the learning process of participants and helped them draw lessons from their experiences as trainers and from the data of a mid-term evaluation. 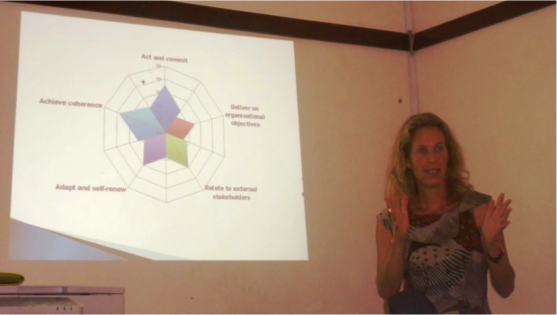 The University College London is coordinating the development of an Impact Evaluation Model that draws lessons from …. And will be available to … Double Loop is involved in providing technical advice and training on Outcome Mapping, Most Significant Change and Sensemaker methodologies. Double Loop has further coached and supported the field work in Uganda. Double Loop has collaborated with Blue360 and a Dutch journalist to document change-stories in the honey value chain attributable to SNV. The assignment included a writeshop and has resulted in a report containing experiences and stories of honey farmers. Double Loop has conducted the evaluation for the USAID funded programme assessing the relevance, effectiveness, impact and sustainability of the program. WWF-Netherlands implements conservation programmes with WWF offices in the South. Staff of the nature conversation department of WWF-NL invest much time in strengthening the country offices, because the success of conservation depends to a large extend on their capacity. In 2013 Double Loop investigated the current OD practice of WWF-NL and prepared a discussion paper on how organisational development could be improved. FOE-E brings together FOE member organisations in Europe in working groups with the aim to organise joint programmes. Coordinating these working groups requires networking skills. Double Loop provided coaching to increase capacity on networking processes. The organisations that implement rehabilitation programmes with funding from the Dutch Ministry of Foreign Affairs held a conference on their Theories of Change in April 2014. Double Loop assisted a group of organisations in getting more clarity on their Theories of Change resulting in options for further learning. Whether in MFS coalitions or in international partner platforms, network facilitation is becoming an ever more important skill for effective collaboration. The workshop at in 2012 at Partos Plaza focussed on essential network processes and key roles in networks. As member of the steering group of the Partos working group on inclusion Light for the World (LFTW) has hired Double Loop to facilitate the learning process. Eight organisations have joined to draw lessons from theory and experience on how marginal groups can be included in economic development. The series of meetings will end in 2015 with recommendations for inclusive development. Double Loop presented guest lectures on organisational assessments at VHL. Mid-career professionals of the international Masters course Agricultural Production Chain Management as well as Bachelor students were introduced in the 5C model and challenged to design organisational change processes. In October 2012 CARE-NL shared the findings of years of learning about supporting governance processes in an international conference. Double Loop was honoured to facilitate the conference and to stimulate exchange on lessons learned. "If you can’t predict what is coming, you have to be continuously learning in order to understand what happened."